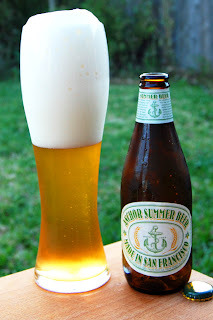 First brewed in 1984, Anchor Summer Beer is not only one of the first summer seasonals, as Anchor points out, it's also the first American wheat beer in modern times. Truly, we have a proper American pioneer here. While summer wheat brews are standard fare today, this beer was cutting-edge stuff back in the day. It's filtered, but there's still plenty of protein left for a big head that the brewery describe as "similar to meringue." The ingredient list calls for two-role pale malt and malted wheat (wheat making up over half of the malt bill) along with Golding and Glacier hops. Crisp and cool as a San Francisco summer. The crisp, clean flavors of Anchor Summer Beer are refreshingly light, a thirst-quenching American-style filtered wheat beer. Well, it's the dead of winter now, but let's think warm thoughts and time travel back to summer when this brew was fresh. Appearance: A crystal-clear golden body capped by a mountain of densely packed white head that fades slowly and leaves nice, patchy lacing. Aroma: Mild grassy hops over a pale, slightly sweet, and wheaty malt body with just a touch of honey. Taste: A mix of weak lemony and grassy hops, golden fruit, and grainy malt. Just a little thin and not quite as interesting as the nose suggested. Apples and husky malt in the finish. Mouthfeel: Medium bodied with smooth carbonation and a clean finish. Drinkability: An easy drinker if it holds your interest. Verdict: Up to this point in my journey, the Anchor beers I’ve tried have always been incredibly solid and have held up remarkably given their age. Unfortunately, Anchor Summer Beer just doesn’t live up to the rest of the line for me in the flavor department. I can see this being the right beer for the market back when it was introduced, but today it just comes off as a little too thin and bland for my tastes. Note: While this review is being published in winter, the tasting notes contained within were taken when the beer was fresh in summer.